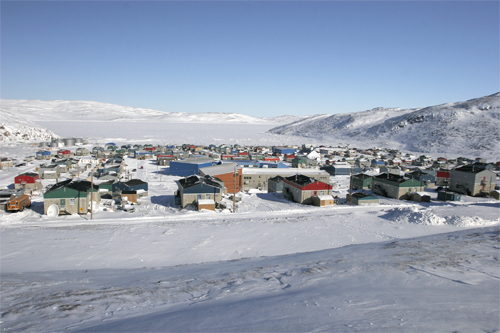 Salluit stands at the far end of the narrow Sugluk Inlet, 10 km inland from the Hudson Strait, hidden between high, rugged mountains rising close to 500 m. Salluit being the middle point between Nunavik’s 14 communities, it is a strategic location for meetings attended by people of the Hudson and Ungava coasts. Though the village’s name suggests that it has not always been the case, the area is rich in wildlife and arctic plants. Though the village’s name suggests that it has not always been the case, the area is rich in wildlife and arctic plants. The coastal seabed teems with mussels and clams. Sallumiut enjoy a variety of dishes which include arctic char, caribou, bannock, berries, roots and herbs. The very harsh climate endured by Sallumiut is indelibly engraved in their way of life, endowing them with an incredible sense of survival. An explanation for the name of this village recounts that, long ago, some Inuit were told the region abounded in wildlife. Yet when they arrived, they found almost nothing to eat and, as a result, suffered near starvation. In 1958, archaeology work was carried out on Qikirtaq Island, at the entrance of the Sugluk Inlet. The evidence collected showed that people of the Dorset period occupied the area from approximately 800 BC to 1000 AD. The three sites excavated were named Keataina, Tyara and Toonoo. The Sugluk Masquette, a minuscule mask 2 cm in size carved out of ivory, was excavated from the Tyara site and dates back to about 400 BC. In 1925, an independant trader opened a trading post on the site of present-day Salluit. Competition was fierce however and the Hudson Bay Company (HBC) quickly established its own post on the far shore of Sugluk Inlet. The following year, the HBC moved to Deception Bay but, in 1930, it built a combined store and dwelling at present-day Salluit. In 1932, it closed its post at Deception Bay. The golden years of fur trading came to an end around 1936 when the price of pelts plummeted. Although a Catholic mission was established in 1930, it operated for only some twenty years. In 1955, an Anglican mission was established and, two years later, a federal day school was opened. As more public services were being delivered, Inuit settled around the small village. The first residential houses were built in 1959. Sallumiut joined together in 1968 to open a co-operative store. Salluit legally became a municipality in 1979. Deception Bay: beautiful site renowned for excellent hunting and fishing. Sugluk Inlet: its waters leave all nature lovers speechless.